Big data has become the next frontier for innovation, competition and productivity. To capitalize on the opportunity, your organization needs solutions that allow you to take control of the data deluge and turn it to your advantage. Dell can help you get there today. 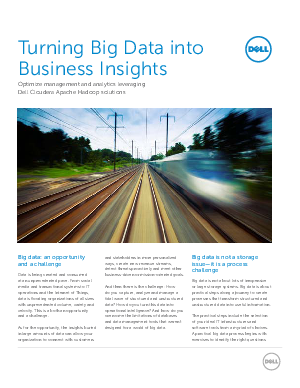 Working closely with key industry partners, Dell is uniquely positioned to help your organization implement cost-effective solutions for collecting, managing and analyzing data—and turning big data into valuable business insights.